Authentic Easy Wood Tools Ci2-SQ Square Carbide Replacement Cutter for Easy Start, Mini and Mid Midi Roughers Lathe Woodturning Tools Ci2-SQ by Easy Wood Tools at N Online Agency. MPN: 2500. Hurry! Limited time offer. Offer valid only while supplies last. This is a Authentic made in the USA Easy Wood Tools Ci2-SQ square carbide cutter designed to fit the Mid, Mini and Easy Start Easy Wood Roughers. This is a Authentic made in the USA Easy Wood Tools Ci2-SQ square carbide cutter designed to fit the Mid, Mini and Easy Start Easy Wood Roughers. Beware of cheap imitations of Easy Wood Tools carbide cutters. Authentic EWT cutters have the optimal 3G's of Carbide - Grade, Grind, and Geometry. 1) The Right Grade: Carbide is basically a mixture of tungsten powder and cobalt that is fused together under high pressure and heat. The ratio of cobalt to tungsten and the size of the tungsten particle are referred to collectively as the 'grade'. There are literally hundreds of thousands of conceivable grades and no 'one grade' of carbide is suited for all applications - whether wood cutting or metal cutting. The perfect combination of cobalt and grain size in EWT Carbide cutters yields a cutting edge that is both the keenest and the most durable grade for woodturning available today. 2) The Right Grind: EWT grinds all of their cutters on super rigid CNC grinders to prevent micro chipping of the cutting edges. EWT uses the proper grit diamond wheels to produce the flattest, truest surfaces possible with minimal grinding scratches left on the surface. All the cutter surfaces are ground in the optimum sequence to bring the edge into keenness during the very last process, or once again micro chipping of the cutting edges will occur if the proper sequence is not followed. 3) The Right Geometry: EWT grinds all their cutters to the correct angles and geometries specifically for woodturning. This produces an edge that cuts both cleanly and safely for all skill levels. Only when grade, grind, and geometry are in harmony will you have a cutting edge for high performance woodturning. Comes with replacement 4-40 countersink machine screw. 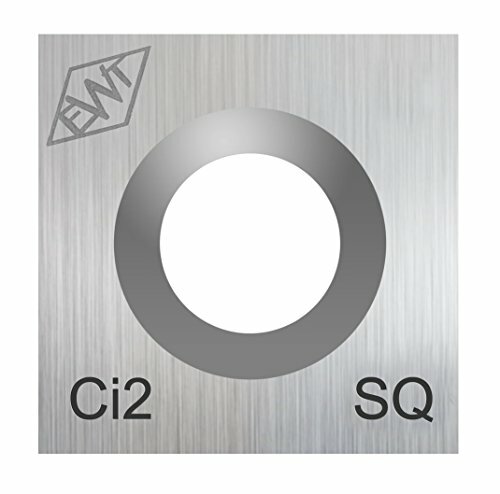 Ci2-SQ cutter designed to fit Easy Start, Mini and Mid size roughers; .430" x .070"; 4-40 screw. The right geometry or cutting angle is ground to the produce an edge the cuts cleanly and safely. If you have any questions about this product by Easy Wood Tools, contact us by completing and submitting the form below. If you are looking for a specif part number, please include it with your message.